I recall a time when I a child with my friends at an amusement park. We stood in line for a brand new roller coaster heavily touted and advertised as being the tallest and fastest ride built to date – a milestone in engineering. The line is huge and stretches far beyond the hour time marker estimate. But this is the reason I’ve come. We’ve cycled through the turnstile and passed the heath disclaimers. After about fifteen minuets I look back to see how far we’ve come and see nothing more than a mass of snaking people anxiously occupying every crevice. All of a sudden I realize that I’m committed. In an instant my heart races and a lump grows in my throat inhibiting the ability to swallow. Turning back is not an option. Welcome to my adult roller coaster. 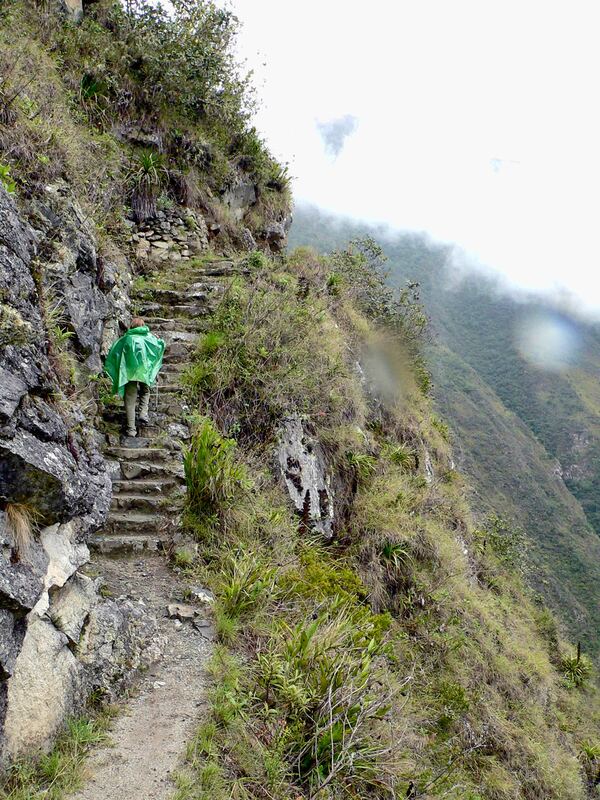 I had a similar moment a couple of hours into the Inca trail but with no full-body safety harness fit for Hannibal Lector. Faced with a growing concentration of steeper staircases I make the mistake of asking Ramiro, our guide, if there are ever injuries. “Well . . . what happens with them?” I ask. “We just move forward” he replies. “Uhh . . . and what if they can’t keep going? What if the injury leaves them unable to walk?” I utter, increasingly breathless. Ramiro was much more sure it would never happen to us than I. I’m sure his impeccable record and reputation with his cohorts depended on it. But I couldn’t be thinking about that I just needed to concentrate on remaining upright and not stepping on my ballooning pancho.